The intake of gas detection devices across a number of industries has significantly increased in countries across the South East Asia region in the past few years. The higher emphasis of companies on health and safety aspects of human resources working in areas that are highly vulnerable to hazardous reactions during manufacturing and industrial processes is fueling the rate of installation of a variety of safety measures. Of the variety of measures undertaken in this regards, installation of gas detection devices has emerged as one of the most essential safety measure in industries such as mining, petrochemical, marine, security, and government. The demand for gas detection devices has also increased in South East Asian countries owing to the rising number and stringency of safety regulations and acts. Governments in countries such as Singapore and Malaysia have imposed stringent regulations with regards to occupational health and safety across industries. The increased need for facility downtime in South East Asian countries has also significantly boosted the demand for smoke detection devices in the past few years. Transparency Market Research estimates that the demand will continue to be strong in the next few years as well. 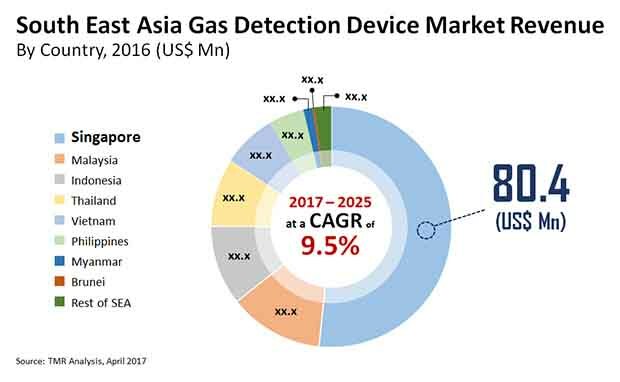 The market for gas detection devices in South East Asia is expected to exhibit a promising 9.2% CAGR from 2017 to 2025, rising from a valuation of US$155.6 mn in 2016 to US$337.6 mn by 2025. In terms of the key areas of application, the report segments the South East Asia gas detection device market into mining, steel mill, petrochemical, construction, automobile, material, food and beverage making and processing, electronics, marine, utility services, government, security, medical, and environment detection. Applications across the materials segment have been examined for materials such as fiber, glass, rubber, and pulp. Of these, the petrochemical segment contributed the dominant share in the revenue of the global market in 2017. The segment is expected to account for a significant 20.5% of the overall market in the said year. The petrochemical segment was followed by marine, utility services and mining segment. In 2017, the marine, utility, and mining segment collectively contributed nearly 39% of overall gas detection device market in South East Asia. In addition, the automobile and materials segments are expected to exhibit a healthy CAGR during the forecast period. Of the key country-level markets for gas detection devices in South East Asia examined in the report, Singapore dominated, accounting for over 51% of the overall market in 2016. The strong growth of the Singapore market is primarily attributed to the thriving petrochemical and marine industries in the country. Large companies have established different manufacturing businesses in the country to exploit the vast growth opportunities offered when its economy was emerging. In the largely mature and developed economy in the present times, boasting well-established industrial and manufacturing segments, Singapore will continue to remain one of the key regional markets for gas detection devices over the forecast period. The market in Malaysia is anticipated to exhibit a significant CAGR of 9.8% over the forecast period. In Malaysia, the detector segment is expected to contribute to the largest market share in 2017 and it is anticipated to expand at a healthy CAGR over the forecast period. Strong presence of oil refinery and crude oil industry is one of the primary reasons for the growth of gas detection devices market in Malaysia. Indonesia also shows positive growth opportunities over the forecast period. Rising investments and projects developed across oil and gas industry is expected to be one of the primary reasons for the growth of gas detection device market in Indonesia. Some of the key players engaged in gas detection device market in South East Asia are Honeywell International, Inc., MSA Safety Incorporated, Drägerwerk AG & Co. KGaA, Industrial Scientific Corporation, Riken Keiki Co., Ltd., New Cosmos Electric Co., Ltd., and Gastron Co., Ltd.
Gas detection devices consist of gas detectors, gas detection transmitters and gas detection controllers. These devices are often used for detecting or identifying concentration of hazardous gases across the various applications such as petrochemical, mining, marine, and others such as electronics, and utility services. Gas detection device market report provides analysis for the period 2015 – 2025, wherein the period from 2017 to 2025 is the forecast and 2016 is the base year. The report covers all the major trends and recent developments playing influential role in the gas detection device market’s growth over the forecast period. It also highlights the drivers, restraints, and opportunities expected to impact market’s growth during the said period. Some of the factors supporting the growth of the market in South East Asia include supportive government policies, acts and regulations associated with workplace safety procedures adopted by various industries in South East Asia region. With increasing demand for enhanced monitoring and reduced safety risk & operational expenses, the market is expected to experience high growth in coming decade. The impact of these and other macro-micro economic factors has been analyzed while developing the market growth models. The study provides a complete perspective on South East Asia gas detection device market’s evolution throughout the above mentioned forecast period in terms of revenue (in US$ Mn) and volume (thousand units). The market overview section of the report establishes the market dynamics such as the drivers, restraints, and opportunities that influence the current nature and future status of this market. Using these factors, the study identifies various trends prominent in the industry and are expected to influence the market growth during the forecast period from 2017 to 2025. An attractiveness analysis has also been provided for every segment in the report, in order to provide a thorough understanding of the overall scenario in the gas detection device market. In addition to this, the report provides an overview of various strategies adopted by the key players engaged in South East Asia market. Key market indicators included in the report provide significance of the factors which are capable of changing the market scenario. These indicators are expected to define the market position during the forecast period. The report segments the market on the basis of product type, device and application. On the basis of product type the gas detection device market is segmented as fixed detectors and portable detectors. On the basis of device the gas detection market is segmented as detectors, transmitters and controllers. Mining (coal & others), steel mill, petro chemical (crude oil and oil refinery), construction (tunnel, subway & others), automobile, material (fiber, pulp, rubber, glass), food & beverage making & processing, electronics (semiconductor and consumer electronics), marine (ship builder, ship owner and ship chandler), utility services (electricity, water, gas and telecommunication), government (firefighting, police, military and border control), security (building & others), medical (hospital & clinics and others), and environment detection (pollution and others) are some of the application areas of gas detection device. The report also highlights the competitive landscape of the South East Asian Gas Detection Device market. Honeywell International, Inc., MSA Safety Incorporated, Drägerwerk AG & Co. KGaA, Industrial Scientific Corporation, Riken Keiki Co., Ltd., New Cosmos Electric Co., Ltd., and Gastron Co., Ltd. are some of the major players operating within the gas detection device market profiled in this study. Details such as financials, SWOT analysis, business strategies, recent developments, and other such strategic information pertaining to these players have been duly provided as part of company profiling. The report also provides a detailed competitive analysis of the key players in the market and identifies various business strategies adopted by them.